This time of the year always seems too early, in my mind, to think about decorating for the holidays. But I also know that this time of the year goes by so fast, that all the appropriate holiday decoration planning should be well on its way to being complete near the end of the month. I admit I hold on to summer way to long…and if it were up to me, I would wrap lights around a palm tree and call it a day. Some households may do this, (I’m not sure what my daughter would think if I did that! ), and this may also work for some businesses too. However, since there are really no ‘rules’ for holiday decorations, the decorations that will adorn a business (outside and inside) will have a direct reflection upon that business. Here are some great ways to decorate a business for the holidays. A tree is generally the focal point of a holiday display. The size of the tree varies greatly and depends on the amount of space your business has to work with. 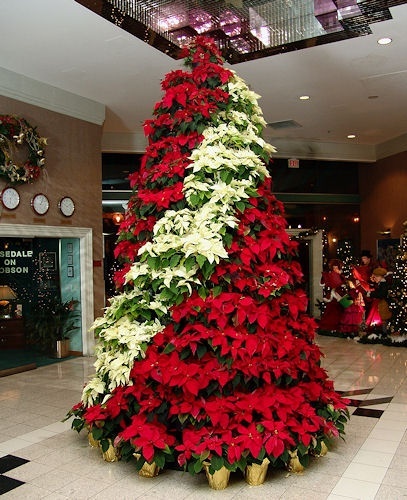 A mall may have a very large tree in the center court or a hotel may also have a very tall tree in the front lobby. Tall trees create a dramatic first impression, especially at entry points. A medium sized tree may be ideal located near a fireplace in a restaurant, ski lodge, or even a spa. And a smaller tree could be a great fit inside a hair salon or office setting. Small trees are ideal for corner locations, so employees or guests don’t feel like they in the woods. Shopping for the holidays would be a bit dull without the twinkle and glow of all the lights, wouldn’t it? The lights are also a great way to increase your businesses visibility, especially if you among many in a strip mall. What a great opportunity to make your business stand out from the crowd and improve the atmosphere around your business as well! When I think of holiday lights and kids, I always think of bugs being drawn to lights. 🙂 But there is some truth to this, kids are drawn to holiday lights and decorations, and they typically aren’t alone…they usually have an adult, maybe two or more with them. Hint: draw kids into your business with lights, decorations, maybe a Santa, or a Christmas activity for them to do, and the parents may just come in bringing a friend or two. Traditionally red and green are the colors to use, however, this is the area where a business can really be unique. A theme can really be useful in this area as well. If a business is celebrating 25 years a silver theme may be appropriate, or if they are celebrating 50 years a gold theme. Make sure whatever theme you decide, that color can be carried through on all of the decorations. We would be happy to help assist in the design of your holiday decorating. Give us a call to schedule an appointment or email us today! You can also view some recent work on Facebook, Google+, and Twitter, see more photos on Houzz, read our magazine on Flipboard, and see what we like on Pinterest!